kdcintx , this would make a wonderful seasonal note card! They seem so cozy in the bubble. Great job! I am curious. How did you create the bubble? Glad you like it. The bubble image is from pixabay which I forgot to acknowledge. I used screen mode the blend the 2 images. kdcintx, thanks! On my way to Pixabay to get some bubbles. I really like this one -- so delicate! I have only just discovered that there are, in fact, 4 Wise Monkeys. The fourth being 'Do no evil'. whippet, very clever and creative! The four snowmen and the four wise monkeys are like two peas in a pod. - Applied a Palette Effects gradient map by Blake Rudis. 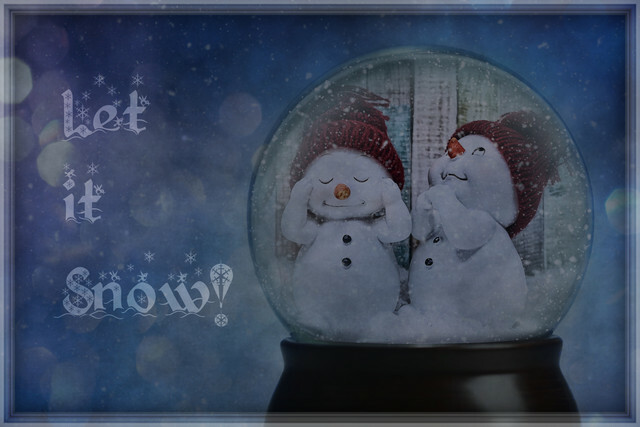 - Created the Snow Globe effect with a template from Photobacks. - Applied a Bokeh overlay by Pro Add-Ons (Screen blending mode, 100% Opacity). - Applied a Slate Galaxy texture by Paree (Multiply blending mode, 100% Opacity). - Applied a frame layer style by Jodi Frye. Wow, lots of very creative edits for this one! PeteB , very creative! 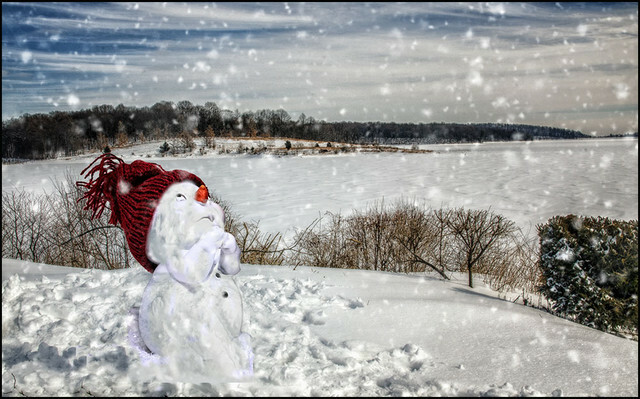 The cute snowman seems to be praying for more snow. Beautiful background image! Like me, I suppose you have known the three wise monkeys most of your life. But have you heard the beginning of 'The Yorkshire tykes motto'? Surprisingly that one passed me by whippet...lol.